Helen Brand gives us the low-down on the penultimate of the year’s birthstones. 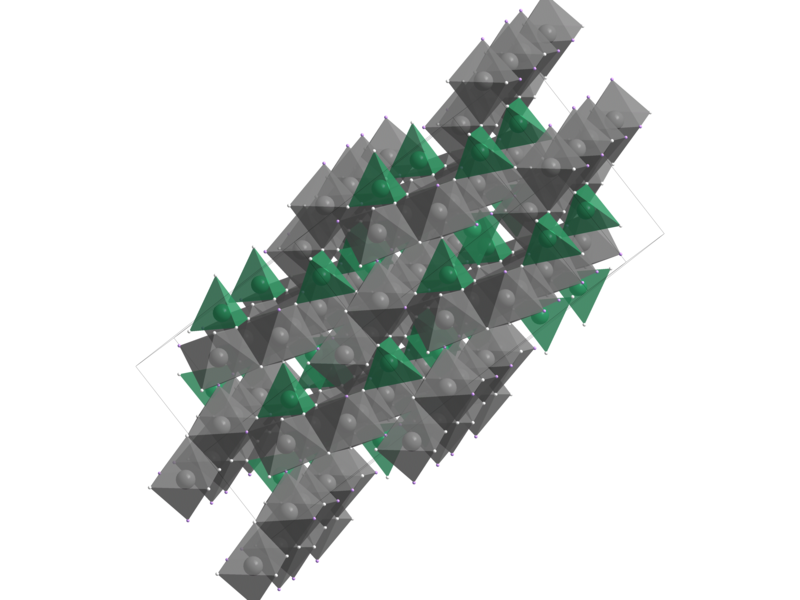 The topaz structure. Image created using diamond crystal structure visualisation package. Al is grey, Si is green, O white and F pink. Topaz is another silicate mineral, this time containing aluminium and fluorine. The formula is Al2SiO4(F,OH)2. It is usually colourless and can become tinted by impurities. 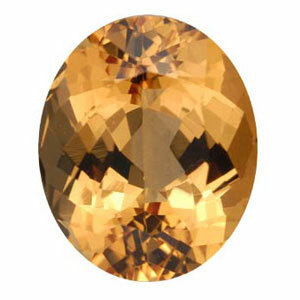 It is the orange topaz which is traditionally known as the birthstone of November. It has an orthorhombic structure made up of corner-sharing aluminium octahedra and silicate tetrahedra. Talking about topaz gives me an opportunity to talk a little bit about one of my favourite rocks: Pegmatites. Pegmatites are intrusive igneous rocks which are composed of crystals which are typically > 2.5 cm in size and this is usually where topaz is found. To be classed as a pegmatite, a rock must be all crystalline with almost all crystals >1 cm in size. There is no typical composition for a pegmatite. The large crystal size is the most striking feature of a pegmatite, with individual crystals reaching > 10 cm in size. Some of the largest single crystals in the world (not counting those mega-cryst caves), are found in pegmatites. Most pegmatites are composed of quartz, feldspar and mica, plus a few other minerals and have a similar composition to granite. An excellent place to find pegmatitic rocks is in Cornwall in South West England. Cornwall has a strikingly different geology to the rest of the UK. Cornwall is underlain by a large batholith – an intrusive body of granite. In various places, this granite is exposed at the surface. Figure 3 was taken at Rinsey Cove in Cornwall. It shows a pegmatitic dyke surrounded by granite. While I was unable to find any literature to say that there have been topaz crystals found at Rinsey cove, topaz was found about a mile along the cliffs at Megiliggar rocks, where a slightly different part of the complex is exposed. Figure 3. 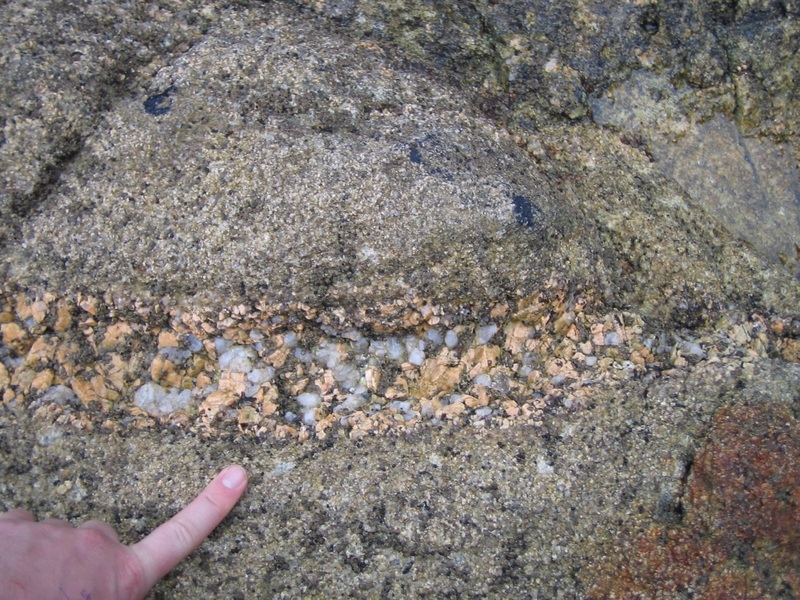 A pegmatitic vein from Rinsey cove, Cornwall. These granites were intruded approximately 300 – 275 million years ago as the northern boundary of a mountain building event called the Variscan-Hercynian orogeny (orogeny just means mountain building event) which occurred when the ancient continents of Euramerica and Gondwana collided to form a super-continent – Pangaea. The granites were molten when they were emplaced and then subsequently crystallised. The hot magma rose upwards and moved through weaknesses in the country rock. As it did this it changed (– metamorphosed), and consumed, the country rock surrounding it. The granites in Cornwall have shaped the economy of the area. They have provided resources which have been exploited by the inhabitants for years. Hydrothermal fluids concentrate precious metals such as tin and copper, they carry the ions in solution and deposit them when new minerals crystallise. Cornwall is littered with mines which extracted these precious metals and also famous for wide occurrence of tourmaline minerals, the birthstones for December which I’ll tell you about next month! Diego Gatta G, Nestola F, Bromiley G D, Loose A (2006) New insight into crystal chemistry of topaz: a multi-methodological study. American Mineralogist 91 1839-1846. It is available on the American Mineralogist Crystal Structure Database. This entry was posted in Mineral Structures and tagged Birthstones, Brand, Cornwall, igneous, Mineral, pegmatities by crystallography365. Bookmark the permalink. Best topaz crystals come from Ukraine, Brazil, Afghanistan and Pakistan. If you watch Prospectors at Discovery, you might notice the great finds of topaz crystals in Colorado.